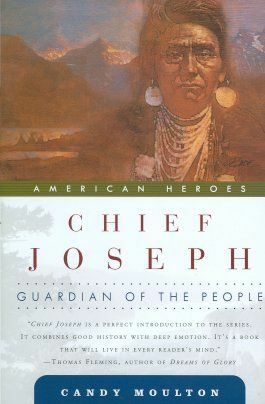 Description: Chief Joseph (1840-1904) became a legend due to his heroic efforts to keep his people in their homeland in Oregon's Wallowa Valley despite a treaty that ordered them onto a reservation in Idaho. In 1877, when the US army forced the Nez Percé away from their lands, Joseph led his tribespeople on a 1,500-mile, four-month flight from western Idaho across Montana, through Yellowstone National Park and Wyoming, toward safety in Canada. During this journey, the Army attacked the Indians several times; in one battle alone, at the Big Hole in western Montana, ninety Indian men, women, and children were killed. The Nez Percés' flight ended at the Bear's Paw mountains in northern Montana, just forty miles from the safety of the Canadian border. There the Army surrounded the Nez Percé, captured their horses, killed all but two of their primary chiefs, and forced their capitulation. When Chief Joseph surrendered to military leaders he told them, "From where the sun now stands I will fight no more forever. "Promised by military commanders that they would be returned to Idaho, the Nez Percés were instead relocated to Indian Territory in Oklahoma where many died of fever and disease. Chief Joseph began a new fight - for better conditions for his people and the right to return to their home country. His diplomacy and eloquence won public support and ultimately resulted in the Nez Percé's return to Idaho and Washington.